Marilyn Monroe was famous and had a famous white dress. I just have a famous white dress! 😀 Its actually taken on a life and identity of its own since the Citta Bella news eh?! My sis told me she wouldn’t be able to borrow it anymore because its just too memorable LOL! A lot of you told me how much you liked it (thank you!) and asked where it came from, or if it was supplied by the magazine’s wardrobe. That dress is actually my own. I bought it from Tang’s in Singapore during one of my visits, under the brand T.S. Not a well known or very expensive brand at all. I was told to attend the photoshoot in a white dress/outfit and as I didn’t have anything white, I had to go out and get one. The dress on the hanger didn’t quite catch my eye. I walked past it quite a few times before asking to try it on, and even then, I wasn’t quite sure about it. Still, I got it just in case I didn’t have time to go out and find one (and I didn’t) and the rest as they say is history. 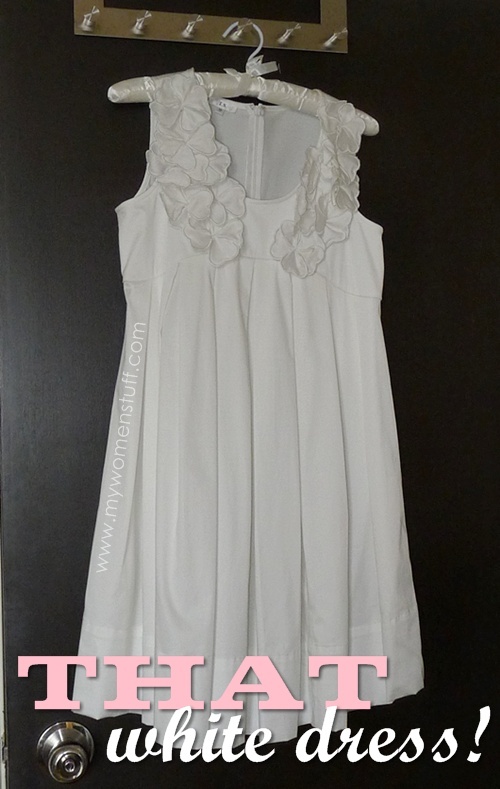 Its a simple white cotton dress with a very flared pleated skirt and is an empire cut which is very forgiving. The flowers along the sides are what add some character to the piece. I have seen some T.S. pieces in Robinsons, The Gardens before this, but I do not know if this dress is there. 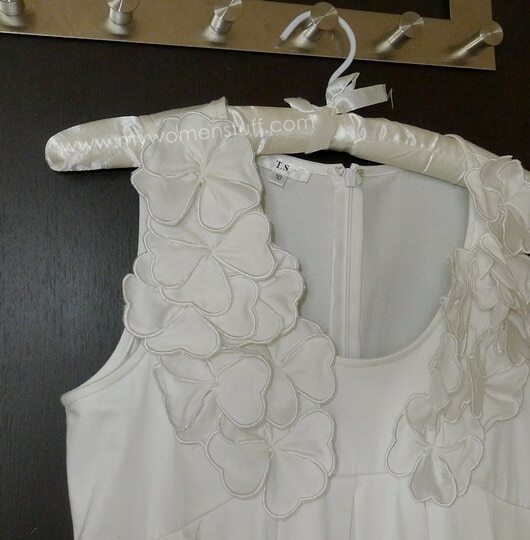 I like this brand – they do very nice well cut dresses that fit me very well and I own quite a few pieces. Its not expensive at all during a sale (the cheapest I paid was S$29) but it can be a little pricey if not. I’ve forgotten the price of this dress but it was a full price piece that I remember cringing over when I made payment for it. Tip: If you are a foreigner and shopping at Tangs, Singapore you can get 5% discount off everything by showing your passport. If you are a Tangs member in Malaysia, you can also show your card for a discount and collect rebates on top of existing discounts. If you spend over S$100 make sure to claim your GST refund if travelling by air. Very,very beautiful dress. It’s so feminine and elegant, and looks really good on you. Love it a lot. Haha is it very me? 😀 I am super happy with that over door hanger! No need for drilling or nails. But I think Ikea discontinued it – silly cows! You can get that kind of door hanger in Jusco too, at those homeware section, where they sell clothes hangers and stuffs. Thank you Sharonkyt! This one has the added benefit of allowing me to eat and eat … and not show bulges haha! Thank you Jenn! 😀 I love that hanger but I think Ikea discontinued it! On the hanger, it’s nothing much. But on you, the dress is looks fabulous. Eeeee, that’s pretty!! If it was in black, I’ll take it in a heartbeat! What a beautiful dress 🙂 White dresses mean so much! Haha… If I see it in Robinsons, I’ll drop you a line! 😉 I think you’d look awesome in it! The over door hanger? It’s really useful! SO Nice! I should go to Tangs more often. You look like a princess! So elegant!